Although we always seek to be cautious in designating funds to anything other than “incarnational missions,” we recognize that this aspect of ministry is nearly indispensable to the work of God, especially in some of the more remote parts of the “Third World.” An old missionary once said, “Missions is really rather simple. All you need is the right man, in the right place, with the necessary tools in his hands to go to work.” We have found this maxim to be true. HeartCry provided this van for Angel Colmenares's ministry in northern Peru. 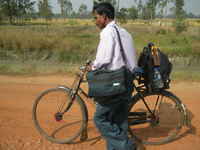 HeartCry has provided bicycles, motorcycles, and burros for pastors in Peru. HeartCry purchased this boat to carry missionaries and Bibles down the Amazon. HeartCry provided this boat motor for the work on the MaraÃ±on River. 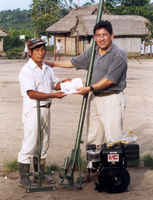 At times, HeartCry has provided clothing for poor pastors in rural Peru.